Teotihuacán (elevation: 2,300 meters or 7,500 feet) boasts the third-largest pyramid in the world, and the remains of an ancient city. Its original name is not known. The archaeological site covers a total surface area of 83 square kilometers and was declared a UNESCO World Heritage Site in 1987. The former grand city is located 50 kilometers (31 miles) northeast of Mexico City on a plateau more than 2,000 meters (6,560 feet) high with a temperate, semi-arid climate. In this region, the rivers and springs could adequately support the irrigation of more than one harvest a year. Water from the San Juan, San Lorenzo and Huixulco Rivers, along with underground springs, allowed the city to flourish for more than 1,000 years. Occupation of the area began around 500 B.C. and lasted a millennium until it was abandoned in the sixth century. At its zenith, Teotihuacán was home to more than 200,000 people, arguably the world’s most populated city at the time. The founders of the city did not leave a writing system. By the time the Aztecs discovered the site, more than six centuries had passed. When the Aztecs founded Tenochtitlán, they adopted the ruins as a ceremonial ground and gave the city the grand name Teotihuacán (meaning ‘Place of the Gods’). The Aztecs named the tallest structure the Pyramid of the Sun because the front wall faces the exact point on the horizon, where the sun sets at spring and autumn equinoxes. This pyramid is 70 meters (230 feet) high with a 220-meter (720-foot) base. It was built around A.D. 150. The neutral stone facade belies its former spectacle: originally it was painted bright red. 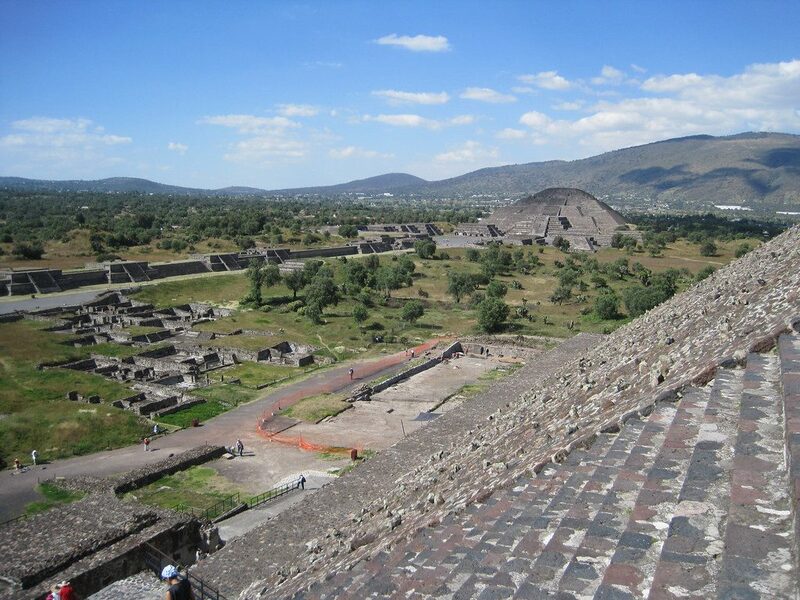 The smaller Pyramid of the Moon was built between A.D. 250 and 600. Another point of interest is the Temple of Quetzalcoatl. The facade features representations of Quetzalcoatl the serpent, a symbol of fertility and renewal, and heads of Cipactli, the mythical crocodile who symbolizes time and creation. The city’s foundation are still intact. It was originally divided into four quarters by two corridors. 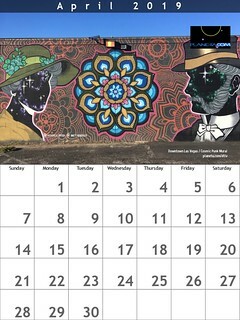 The north-south avenue is called Avenida de los Muertos (Avenue of the Dead), again named by the Aztecs who believed (incorrectly) that the buildings were tombs. Most sacrifices in Teotihuacán were made to Tláloc, the god of rain, fertility and water. During the early half of the first millennium, Teotihuacán was the largest city in Mesoamerica, with more than 100,000 inhabitants. 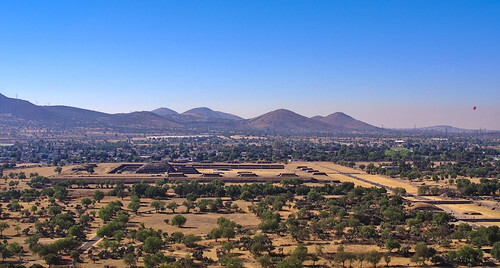 Teotihuacán traded with other Mesoamerican empires, including the Maya. Teotihuacán’s ceramics, obsidian crafts, and architecture are found in distant cities such as Monte Albán (Oaxaca), Tikal (Guatemala), and Copán (Honduras), while other cultures’ goods and crafts have been uncovered in Teotihuacán graves and caches. This represents a cross-cultural exchange much like finding McDonald’s Happy Meal toys in a rural village, or Maya crafts in a New York boutique. The city functioned for centuries until its collapse in the seventh century. What happened? There is evidence of malnutrition and environmental neglect in the region, especially the deforestation of nearby hills which were and still are rich in obsidian (used for ceremonial knives and figures) and clay deposits, used for ceramics. Today the park offers more than a glimmer of its former greatness. To gain perspective, visit the museum and botanical garden. The garden is well signed and the museum showcases the ceramics and sculptures that have been excavated. This is one of the best museums in the country and admission is included in the entrance fee. One room contains a miniature representation of the metropolis, covered by a plexiglass floor. Just walking across this room gives the visitor an eagle-eye view. Scale models also show how the city might have looked around 500 A.D. Archaeologists are warning that the Temple of Quetzalcoatl has sustained structural damage. Deterioration has been caused by insufficient drainage to release water the building accumulates during the rainy season. One solution is to update the original drainage system.